Posted by Brilynn at 9:18 p.m.
Ohhh this post would have come in handy last night when I was spooning my left over chocolate lamington icing/sauce into my mouth straight from the bowl, with it running down my face and looking ever so not classy! Yuuumm idea!! Here in France it's not usual to use cream cheese icing and I can't find a good recipe, could you share yours with me/us? That looks so good that is wrong! wow! what a article I'm just trying to make some diet here but I failed it again after I read this info. I ate an enormous vanilla ice cram with berries. Such a brilliant idea and why hasn't anyone else thought of it before? That is right fill the strawberries with it! Good idea! you guys always make me hungry! Love your work on Jumbo Empanadas! And I wanted to personally invite you to be one of the top cooking Advisors on ShopSquad, a free shopping advice website where shoppers and your readers can ask Advisors (i.e. you!) for advice. Ha I do that too! I make a big batch of frosting and any leftovers, I find another use for. I've actually used leftover cream cheese frosting, added an egg, and made it the marbling in pumpkin cream cheese bundt cake and it was delicious. 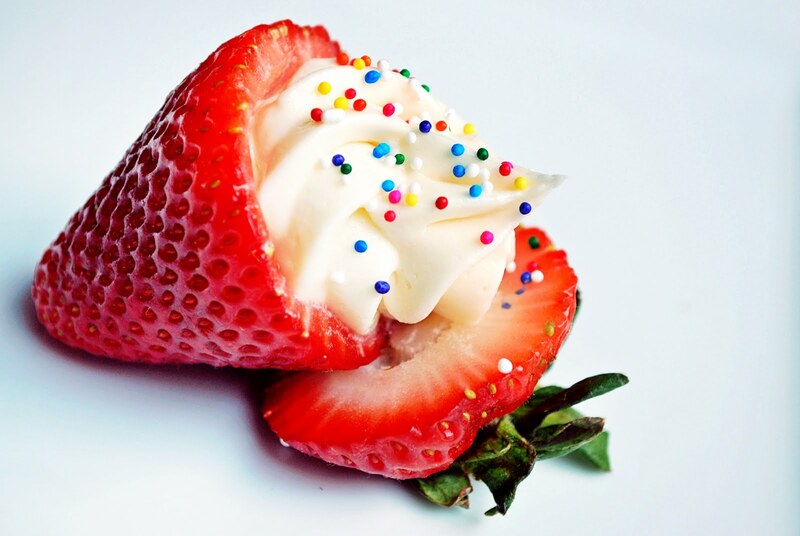 what a fun way to eat a strawberry!